Fire meets Bigger Fire, oh and there's Magic too. When Danny first told me he was collaborating with Bosco Francis, I was like who's that? I must be like the only mountain tortoise/katak bawah tempurung. A quick Google brought up tons of coverage of "My Magic", the award-winning and critically acclaimed Eric Khoo movie that was the darling at the Cannes Film Festival a few years back. Man, where was I? Anyway, long story short - check out this clip of 'My Magic' that was posted on the OMG Facebook page, and you'll get a rough idea of what Bosco Francis can do with fire and magic. My Magic is the story of the estranged relationship between an alcoholic father and his 9-year old son. The film was shot in just 9 days and received a standing ovation at the Cannes Film Festival and there was even buzz that Bosco could have won Best Actor for the festival. Check out this news report from CNA, where Eric Khoo talks about the film and about Bosco. And if that's not enough :), have a sneak peek at Danny practicing with Bosco here. 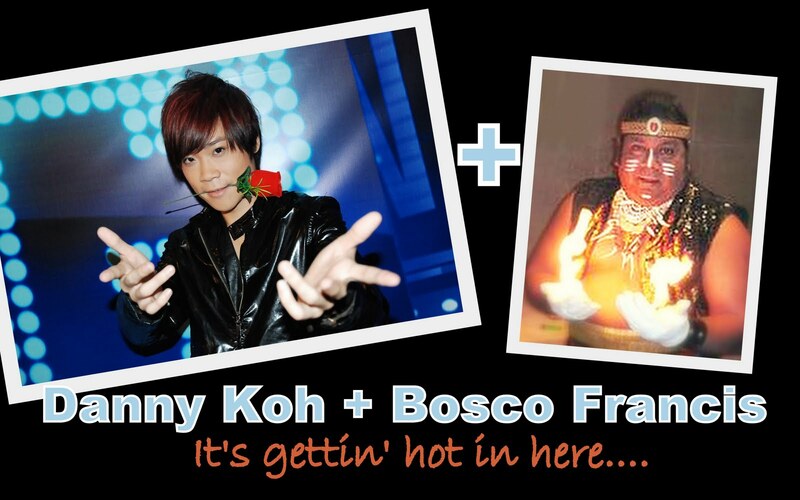 Danny's face is all scrunchy with all that fire flying everywhere - this collabo is sure to be a really exciting one! Wonder if the audience will go 'Whoa!' or 'Oooh!' and 'Aaah!' We'll find out tomorrow night - if you're coming for the taping, be at reception by 7pm to get tickets at the door.